Due to the strict censorship at the time, very little was known or reported back in Australia, and the only media coverage of the event was to come in the years after the war with the Diggers telling their stories. Even less was known in the United States. For the men that were present on the day of the crash this is something that has stayed with them every day of their lives. They never have, and never will forget the tragic loss of life of their mates. The first official memorial commemoration for this crash was 70 years after the event. 6 September 2013 an information session followed by a wreath laying ceremony was held at the Australian War Memorial in Canberra. 7 September 2014 a contingent of 2/33 Australian Infantry Battalion AIF Association members, together with NX81054 Ronald Bean, a soldier present on the day of the crash, travelled to the crash site in Port Moresby where a dawn service was held followed by a plaque unveiling ceremony. 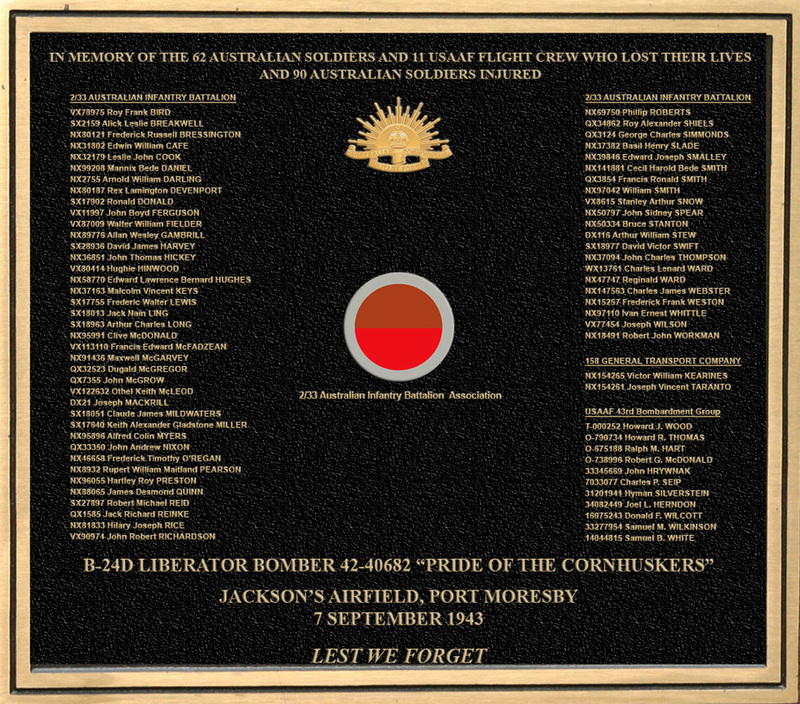 The plaque was commissioned by the 2/33 Australian Infantry Battalion AIF Association through donations from it's members.